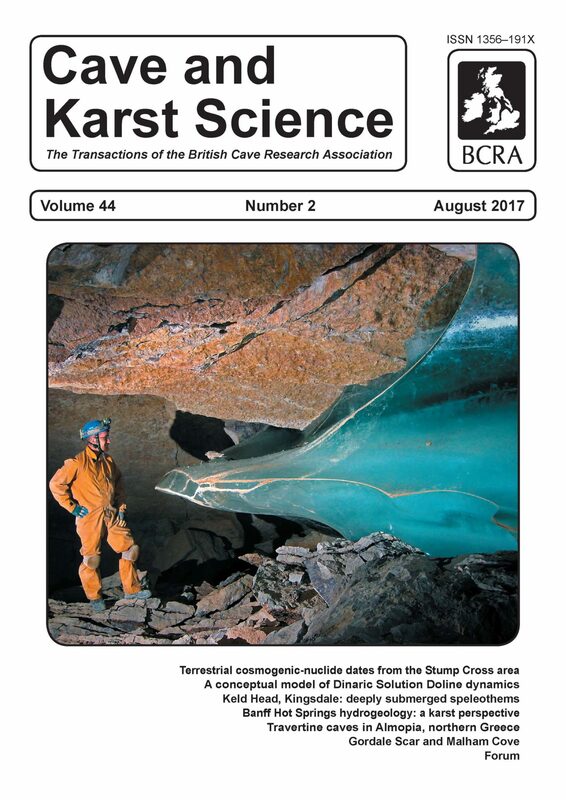 Cave and Karst Science’s August 2017 issue is now available. Volume 44, Number 2 carries six main articles, starting with ‘Deeply submerged speleothems in Keld Head, Kingsdale, Yorkshire’ by John Cordingley, David Lowe and Tony Waltham, which examines the significance of a deposit of laminated flowstone lying at a depth of 9m, 550m into the Marble Steps Branch of the cave. The paper is well-illustrated with surveys, diagrams and photographs and goes into the implications of the deposit for both the history of the cave system and the timing of the Quaternary deepening of Kingsdale. The paper provides a fascinating glimpse of what Keld Head might have looked like at the time when its deepest flowstone was growing, and the system appears to exhibit the deepest known calcite speleothems in any British underwater cave. A date for the flowstone is awaited. A paper by Georgios Lazaridis, Konstantinous Trimmis and Spyridoula Pappa on travertine caves in Almopia, Greece provides information on seven caves that have been explored and surveyed within two travertine terraces in Greece’s Almopia region. Of the two, the Aspi terrace is less faulted than the Baina Terrace, and the differences between them could be related to the degree of faulting. In travertine caves, the age of the cave formation is contemporary with that of the host rock, which differs from karst caves which are formed by dissolution of significantly older rocks. The photographs are excellent and several surveys show how short many of these caves are in comparison with karst caves. Phil Murphy makes some further observations on two iconic landforms, Gordale Scar and Malham Cove, and looks at their settings and relationships with an emphasis on their differences and how or why these might have arisen. This short paper provides an interesting contrast between two features that will be familiar to many cavers. An eight-page paper by Slovenian karst scientist France Šušteršič proposes a conceptual model of Dinaric solution doline dynamics, and discusses a simplified model of the dynamics of solution dolines. The author makes it clear that firm conclusions cannot be drawn and that any statements are to be taken as no more than initial guidelines for future investigations. Despite the simplified nature of the paper, the content is heavily mathematical, as are the numerous diagrams. Peter Wilson, Tom Lord and Ángel Rodés examine the glaciation and deglaciation age of the Stump Cross area in the Yorkshire Dales as determined by terrestrial cosmogenic nuclide (10Be) dating. The ages of gritstone boulders in the vicinity of Stump Cross Cavern provide evidence of glacier ice in the area at the Wharfe-Nidd interfluve and the results show that the deglaciation of the Dales was likely to have been well-advanced around 18 – 16 thousand years ago. In the final paper, Charles Young and David Lowe look at the Hydrogeology of the Banff Hot Springs, Banff National Park, Canada, from a karst perspective. At 12 pages, this is the longest paper in the issue, but it is well supplied with diagrams, surveys and photos and their conclusions contribute to a broader understanding of the area and its watercourses. The issue starts on a sad note with an obituary of caver and cave scientist Noel Christopher written by John Gunn, which includes a list of his various publications. At the end of the issue, the Forum section has a review by Duncan Price of the recent publication Adventures Underground by Dave Haigh and John Cordingley and a short, personal account on the historical scientific interest of dating the Dales caves by Tony Waltham. Cave and Karst Science is published three times a year and is free to paid up members of the British Cave Research Association. Non-members can obtain copies for an annual subscription of £28 (+ postage for non-UK destinations). A discounted student subscription is available. Details are available from the BCRA bookshop.The publication contains a wealth of information and represents excellent value for money for anyone with an interest in the title subject. It is well-presented throughout, with a clear, attractive layout.